Unfortunately, in 2004, Michael was unceremoniously ousted from Van Halen to make room for Eddie Van Halen’s son Wolfgang in the bassist role. Not to throw a pity party, Michael instead formed a new group with close pal and former Van Halen lead singer Sammy Hagar, legendary guitar virtuoso Joe Satriani and Red Hot Chili Peppers stickman Chad Smith. 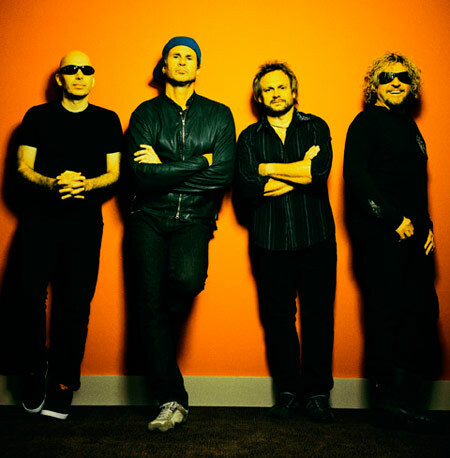 They dubbed themselves Chickenfoot, and have since released two albums; the second of which is humorously titled Chickenfoot III. The four-piece unit is currently gearing up for the second leg of their U.S. tour in support of it. 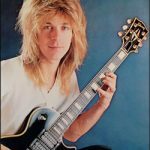 Many hard rock fans also know of Michael’s extracurricular pursuits – hot rods, collecting Mickey Mouse watches, acquiring old unreleased and bootleg Van Halen tapes, and fiery foods. It’s that last passion that chileheads have taken an keen interest in. 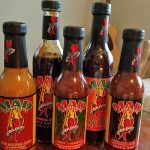 Mike – or “Mad Anthony” as he’s sometimes nicknamed – is a well-known heat freak in the rock ‘n’ roll world who hooked up with Ring of Fire Hot Sauce creator Mike Greening of Mike and Diane’s Gourmet Kitchen. Between the collaboration of the two Mikes, they unleashed Mad Anthony’s Hot Sauces, which include a lineup featuring the his original Hot Sauce, the XXXTra Hot Private Reserve (read my review of this here), Fiery Mustard Sauce, Original Style BBQ Sauce and Extra Hot BBQ Sauce, plus an upcoming (and as of this writing untitled) bhut jolokia-based seasoning. 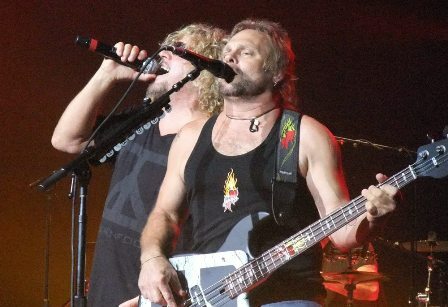 Scott: How is this Chickenfoot album and tour going compared to the last one? Mike: We’re really proud of the record. As far as the tour’s concerned, we kind of started out the same way as last time. In November we did a handful of shows, we called it the Road Test Tour. It was more promotion. There was more press involved. They were smaller shows, such as theatre shows. We did about five of them. We just got back from Europe almost a month ago. We went out there, and almost did the same thing; to kind of promote the band or whatever and to do a bunch of press to generate the interest when we go back later. Right now we’re actually putting together the American leg of the tour that will start in early May. Scott: How much do you think Chickenfoot is gelling more as a band compared to how it was when you guys first got together? Mike: Obviously the time we spent together on tour the last time, and then back in the studio again, it’s been quite a bit. The only thing that’s different from last time is that [drummer] Chad Smith is not with us. He had to go back to the Red Hot Chili Peppers, and they’re on tour right now. So we have a guy named Kenny Arnoff to fill in his shoes. He’s a great drummer who was actually recommended by Chad. Kenny’s going to be doing a lot of the live stuff with us. It’s kind of like a little change in the dynamic but Kenny’s a great drummer. A big part of doing the early shows that we did was to see how he was going to fit in. And he fit in really well. Scott: How’s the fan reaction been to the music you’re playing out on the road? Mike: it’s been great. You know, all the shows that we did in Europe were all fantastic and it’s just a point of getting out there and doing it. Scott: I’ll refrain from the Van Halen questions because they’ve been done ad infinitum. Let me ask you some spicy food-related questions, Mike. How long have you been a chilehead? Mike: Oh my God (laughs). It actually started around the time I started dating my wife Sue. We’ve been married for just over 30 years. It’ll actually be 31 years next week. Mike: Yeah. And then after that it was bragging rights, you know, “I can eat it hotter than you!” and stuff like that. Within the last several years, it’s been more on the flavor side, too. I still like it REALLY hot, but it’s not all about just the heat anymore. Mike: So it was about 1971 when I really got hooked. 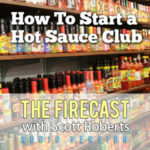 Scott: How did you hook up with Mike and Diane’s Gourmet Kitchen, who makes the Ring of Fire Hot Sauce? Mike: It was several years back, around 1995. It was the time of [Van Halen’s] Balance album, and we had a song called “Don’t Tell Me What Love Can Do”. We were shooting the video for it, and [the catering company] had some of this Ring of Fire Hot Sauce. And I REALLY liked it! 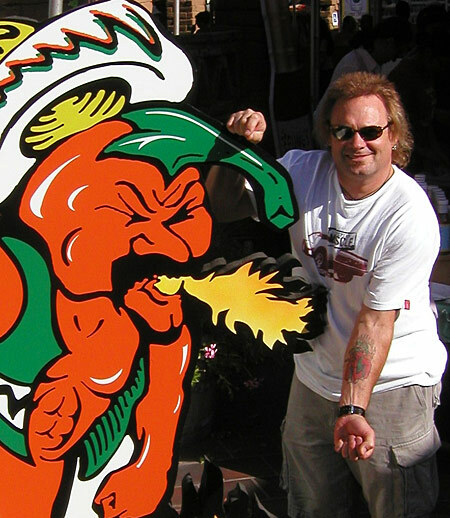 And I also loved the logo on the bottle; it was the chile pepper guy blowing the flame out of his mouth. So the catering gave me the bottle. Later I thought, “Hey, I’m gonna get a tattoo of this on my arm,” because it was such a cool logo. I ended up doing that. I got this big tat on my forearm. At next year’s NAMM show, those same people came by and gave me Ring of Fire hats and sauces, and said that Mike and Diane were fans of the band and everything. It was right around that time that everyone was egging me on to do my own hot sauce, which was the early ’00s. I went to Joe Perry of Aerosmith, and then I talked with Ashley Foods who was doing Joe’s stuff [Joe Perry’s Rock Your World Hot Sauce] and they wanted this exorbitant amount of money, and they wanted to mix this up, and just basically wanted me to slap my name on something that they came up with. I wasn’t about that at all. I wanted to be more involved in the development of the sauce and the taste and everything. So I thought, “I’m going to give Mike and Diane a call.” I got to talking with them and Mike thought it would be a great, fun project to do together. I, too, thought it would be fun. I didn’t have any big, grand visions of being a hot sauce king or whatever. We just started working on some stuff, and in 2004 it came out. Scott: And I think it was around 2005 when I first tried your sauce, Mike. 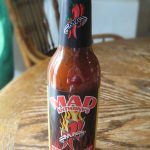 I was a big fan of the Ring of Fire sauces already, and I thought that the Mad Anthony’s stuff was fantastic, that it was on par with the Ring of Fire sauces. I’m pleased that it was actually quality stuff instead of the usual crap that celebrities slap their name on. So how was the development process done for the Mad Anthony’s sauce? 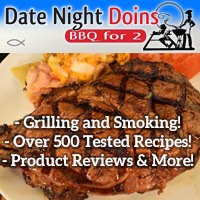 Did you drive or fly down to the San Diego area [where Mike & Diane’s Gourmet Kitchen is located] to periodically taste the sauce? Well, it helped with us both being in California. I lived in Glendora, California and Mike is in El Cajon. I would either go to their place, or he would just Fed Ex me stuff. And obviously as far as the process of all the technical terms of this, that and whatever, I may not know, but I know what I like. Mike Greening would go, “Well, we can’t do this”, or “If we would add a bit more of this the sauce it’s gonna make the sauce do this”, and I’d just tell him, “This is what I like”. We just went back and forth. He had a base sauce he sent me and we just kind of tweaked it from there. 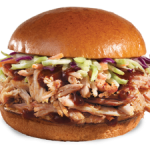 It was really cool, because when it was done it was a flavor that I helped create and that I was proud of. Mike: We’re working on a shaker rub right now. 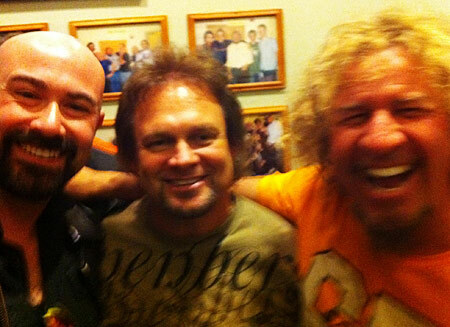 Within the last Chickenfoot tour, we were in San Antonio, Texas and I discovered the ghost chile. We’re going to work on something with a little more kick, using some of the bhut jolokia peppers now. The current sauce is the big thing for me. I use all of Ring of Fire’s retailers, and they do all that for me. And now, I’m looking to even grow the business a bit beyond that. I’ve been to a few food shops here on the west coast. One is called Bristol Farms; they’re kind of like a specialty foods store. I just recently took my sauce in there [to see if they will carry it]. Mike and Diane’s aren’t really looking to go big time with this, so I might have to make the decision to move on to someone else. They would be totally cool with that if I wanted grow with this. But right now, we’re just having a lot of fun with it. Scott: Have you encountered any resistance with the tagline you used on the Mad Anthony bottle labels, “So hot, you’ll need two a**holes!”? Mike: But we have since changed the label. It now gives a little bit more background on me on it, since before people would ask, “who’s this Mad Anthony? Who’s Michael Anthony?” So there’s a little bit of copy on the bottle that gives a brief insight to being in Van Halen and how I got into loving hot food. But we have dropped the “two a**holes”…unfortunately. Scott: Well, I guess it was good while it lasted. Mike: Yeah, well I thought to myself if I’d really wanted to get a little bit beyond what I was doing, we’d have to make a couple of changes in that sense. Scott: Those older bottles with that tagline might become collector’s items. 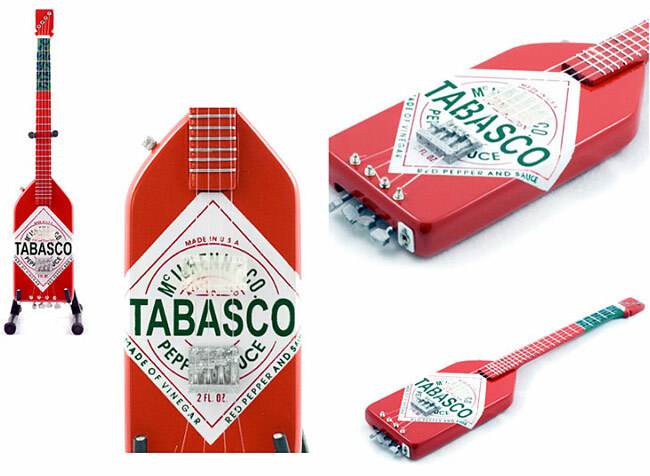 Michael once had a bass built that resembled a Tabasco Bottle. A miniature is available for purchase on his website. Scott: Speaking of collector’s items, a lot of fans know that you have an extensive Mickey Mouse watch collection. Do you similarly collect hot sauce bottles? Mike: Yeah. Besides the fact that when we go out on tour, people always give me hot sauce. “Here, try this, try that!” I’ve got a whole array of hot sauces. It makes my wife mad. I take up a whole refrigerator door and half of our pantry with hot sauces! (laughs) There’s quite a few that I collect just because of the names and the labels, and anything cool that I’ve come across. And then there’s the same circle of ‘go-to’ sauces that I use every day. Scott: What are some of those? Mike: There’s the Ring of Fire sauce, of course. Their Habanero Sauce; I love it! We’ll do stuffed hamburger patties and stuff like that using it. There are certain foods that I love that on. And then there are other foods that I put nothing but my sauce on. I’ve got Trinidad Hot Sauce, El Yucateco…there are different ones for different foods. Scott: Same with me. I have my favorites, plus I’m always trying to discover new things. Has anything new out there in the fiery foods world inspired you to think, “Hmmm…I need to make a hot sauce like this one!” and create a new product based on that? Mike: Basically the one thing for me was trying the ghost chile. Like I had mentioned, we were in San Antonio. I’m a big fan of Man v. Food, and [host Adam Richman] was in a place down there called Chunky’s. They had what is called the Four Horseman Challenge, and they make a burger with four chiles…the habaneros, jalapenos, serranos and the ghost chile. Read about Scott’s homemade attempt on conquering the Four Horsemen Burger here. Scott: Did you try the challenge? Mike: No, I didn’t. But my future son-in-law did. Two bites into it, and they almost had to haul him off to the hospital! (laughs) But I did have a ghost chile burger. It was really interesting and I thought, “if I’m gonna step it up, I’m going to do it with this pepper”. And I know that since then, there have been a couple of other [chile peppers] that are even hotter. Actually, with the bhut jolokia pepper, I kind of like the smell of it and everything. And Mike Greening and I are working on a shaker rub using that pepper. 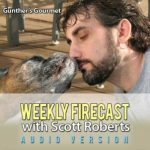 Scott: What about a new sauce using the bhut jolokia? Scott: Do you have any crazy hot sauce or chile pepper-related stories that have happened over the years? Mike: Well, this was years ago when Van Halen were playing in Boston, and I remember the guys in Aerosmith came to our show. It was in the early ’90s. We were playing and someone mentioned they were at the show. I was all excited, and came off stage and one of them had a bottle of habanero olives. I was literally right off the stage, sweating and I was so excited because I had never seen habanero olives before and immediately ate two of them. 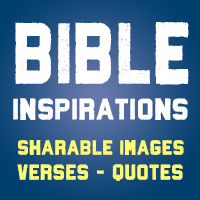 I was hiccuping, I was almost hallucinating…. Scott: Sometimes the heat will surprise you when eating spicy items. Sometimes whatever it is will soak up the heat, and you underestimate it. Mike: After we went to Chunky’s in San Antonio, the owner of the place had given me a huge Ziploc bag of dried ghost peppers. I brought ’em home and used a couple of whole ones; ya know, for making chili and stuff like that. And then I thought that I would grind some of these up and use them like a shaker. [Another thing that happened] was over the holidays the other year. I said, “I wonder would it would be like if I sautéed up some ghost peppers?” I threw some in a pan, started to sauté them, and when it started to smoke, everyone had to leave the house! Scott: Oh yeah, it’s like a tear gas bomb going off. Mike: Yeah, you couldn’t even breathe! And then a week after that, I read on Yahoo! News that in India they were developing some weapons using the ghost chile to create a pepper gas- type of thing. In my kitchen it was sooooo bad! (laughs) It’s kind of cool, though, discovering stuff like that. Scott: In the rock n’ roll world, is there anyone you would consider being a crazier chilehead than you? Someone who is insane when it comes to heat tolerance and all-out bombast when it comes to chile peppers and hot sauce? I have a brother who’s a couple of years younger than me and he can eat habaneros like they’re jelly beans. He’s the only other guy that I’ve encountered. I throw up my hands and say, “You’re the king!” as far as anybody I know. 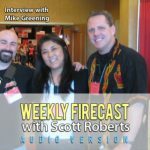 Scott: What about your fellow members of Chickenfoot? Any of them like hot stuff? Mike: I try to get our band into it. Sammy really loves our mustard. Joe really loves the regular hot sauce. Scott: How about back in the days of Van Halen when you first started to get into this? Did they think you were out of your mind then? Mike: Nobody wanted to sit around me when I was eating after the show! (laughs) Everybody in the band knew to stay away from me. What was really cool was that once the fans found out that I was into hot foods; when we would get into a city they would give me stuff. Obviously, a lot of it I didn’t want to eat because it was homemade wasn’t labeled and they would go, “hey look at this hot sauce that I made!” But people would also give me all kinds of jalapenos, habaneros, serranos and other chiles…They’d also tell me, “hey, you need to make your own kind of hot sauce!”, so that’s kind of how that started. On tour I’d have to open up my wardrobe case and would always have to shift my clothes around [to make room for sauce bottles]. When I’d come home from tour, my wife would be so pissed because I’d have like 40 bottles of hot sauce with me. 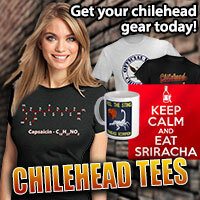 Scott: Ever go to any hot sauce or chile pepper shows or festivals to try stuff out or to hang with other chileheads? Mike: Mike Greening told me there’s one in Albuquerque that they go to. He and Diane once invited me one year but I couldn’t make it. That’s one I’d like to go to. Scott, are you familiar with the one I’m talking about? Scott: Oh yeah. On my website I have a calendar of chilehead events. That one is called the National Fiery Foods and Barbecue Show. There was one a few weeks ago that took place in Texas called ZestFest. Mike: I remember that one. 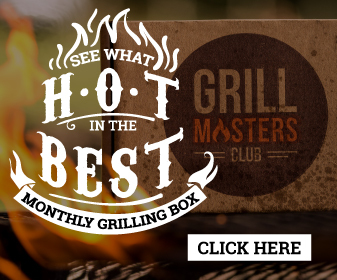 When our sauce first came out in 2004 we entered it in their [Fiery Food Challenge] contest. Mike Greening suggested, “You ought to enter it”. He had never won it himself. I entered my hot sauce in the general hot sauce category. I also entered my mustard, which we didn’t even have a label for yet! I came in second place in the general hot sauce category, and won first in the hot mustard category. 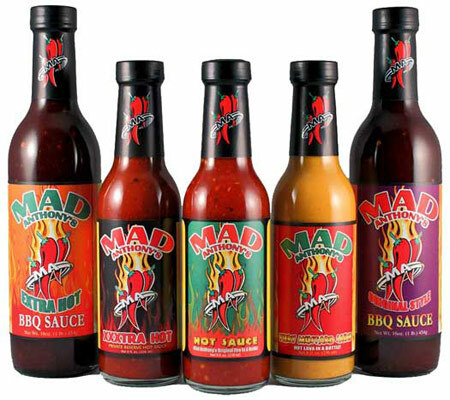 For more info about Mad Anthony’s Hot Sauces, Chickenfoot, or Mikey’s many misadventures, go to MadAnthonyCafe.com. Many thanks go to Steve Seabury of High River Sauces. ← Help Puckerbutt Pepper Company Give to the Snowdrop Foundation in a Charity Auction!